My neighbor Millie had a Thanksgiving high. She ate so much stuffing, sweet potato, and pumpkin pie that her blood sugar was over 300 for 28 hours. One day isn’t horrible, but then came the leftovers. “I forgot how much I like turkey stuffing and gravy,” she said. “I should have made the family take it all home, but I wound up having it for breakfast and dessert for three days.” She only stopped when the neuropathy in her feet went from being a mild pain to a throbbing torture. It took three days for the pain to let up. Thanksgiving is over, but more holidays are coming. The holiday season can be a beautiful time. But holidays can cause personal and family problems, stress, and seriously complicate your self-management. This week I’m thinking about managing holiday foods and drink. Next week I will write about holiday emotional and money issues. • Managing holiday feasting. 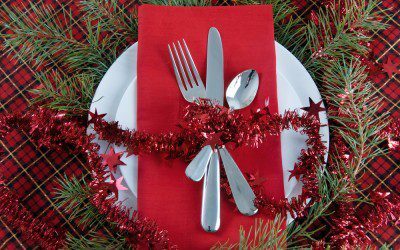 Holiday-season food tends to run high in carbohydrate. Stuffing, squash, pies and cakes, yams, and even fruit salads are very high-carb and will likely send your sugars soaring. What can you do about that? You probably can have some of whatever they’re cooking, though. It’s about portion control. Small amounts will be manageable, even if you have to cover them with insulin. Fortunately, holiday meals also include a lot of things you can eat. Fill up on turkey and salad and you’ll be less tempted by the noodle casseroles or candied yams. Salads can be really delicious and filling. They’re not just lettuce and tomatoes. You can use different kinds of greens; crunchy things like carrot, jicama, celery, or beet; a little bit of fruit; nuts; seeds; cheese; or meat. You can experiment with different dressings as well. Here’s a whole page of delicious-looking salad recipes from Better Homes and Gardens, and here are our diabetes-friendly salad recipes. You can also control quantities. Decide in advance how much you want to eat. Serve yourself instead of letting others pile your plate. Savor every bite. Really paying attention to your food might even help you handle family stresses that come up over holiday dinner. Drinking large glasses of water will also control intake and leave you feeling less dehydrated after meals, according to the website Hella Wella. • Leftover control. You don’t want a whole bunch of tasty starches and sugars inviting you to a party in the refrigerator. Send them home with your guests. My partner Aisha makes sure we have lots of Tupperware containers for people to take home leftovers. • Remember to give thanks. Even a few words of gratitude or prayer will reduce stress, let people focus on their food, and probably help them eat less and enjoy it more. I have found I can do this even if it’s not a family gathering. People may not be used to giving thanks, but nobody has ever objected. • Saying no to sweets. I went to a holiday party recently where almost everybody brought homemade desserts, and let me tell you, they looked fabulous! It was really hard to resist trying all of them. Different websites give a variety of ideas for reducing holiday sweets. Don’t go to a party hungry. Take a healthier snack with you. Put extra sweets away where you can’t grab them easily. Set a realistic limit, which is probably greater than zero sweets. The problem with alcohol isn’t always the direct health effects. It’s often the stupid things you do when you’ve been drinking. Alcohol makes unhealthy food more attractive and may override your food plans. It might also get you into fights and arguments with family, or into unwanted romantic behavior. Don’t even think about driving. Drinking aggravates family stress. My friend Walter had to leave home after a family holiday party where some very hurtful things were said under the influence. He still hasn’t been invited back. If you do drink, drink moderately. The American Diabetes Association says two drinks a day for men and one drink a day for women is OK for a person with diabetes, but more is not good for you. Alcohol increases the risk of hypoglycemia (low blood sugar) by preventing the liver from putting out extra glucose when needed. This is usually not a problem with meals, but at an afternoon or evening party without food, it might be. The website Doctors Health Press advises, “Decide how many drinks you will drink and stick to that number.” Again, for someone with diabetes, this should be a maximum of two for men and one for women. And remember that you might wind up nursing a glass for quite a while, because if you finish one, somebody will offer you another. For Scott Coulter and others with a chronic health condition, the consequences of the health-care debate are real. Bookmark DiabetesSelfManagement.com and tune in tomorrow to read more.